What started as a cramped wine shop slowly but continuously grew into a fixed star for wine aficionados in the heart of the Navigli neighbourhood. After a complete overhaul of the interior design Vinaccio’s tiny space is now one of the (unfortunately) not so many places in the area offering a truly unique and authentic experience. 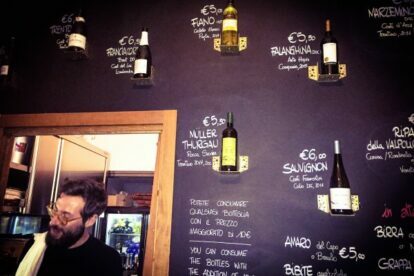 The wine list changes frequently, is written on the chalkboard wall behind the bar (which, BTW, is a really nice way of doing it!) and is very well curated. Alessandra and Daniele – the two amazing folks running this enoteca – are always prepared and happy to help you make a good choice. Both of them are professional sommeliers, knowledgeable and, most importantly, passionate about what they do. Thus, they’ve succeeded in creating a place which definitely has soul and embraces everybody with its warm vibes and convivial atmosphere. During aperitivo time, each glass of wine comes with a little buffet of snacks. Make sure to grab some of the tomato salad or cream cheese freshly prepared by Dani. Supplies never last too long. Last but by far not least, Vinaccio is a good choice for everybody enjoying to meet new people since the spirit of ‘sharing is caring’ created by Ale and Dani is not just trite words but attracts a special and very charming breed of people, coming back regularly, always prepared to integrate newbies in their chats. Not surprisingly, I’ve met some of my best friends at Vinaccio. Super-recommended, don’t miss it!